← Tutorial for Scrap Bag Bag. Part 2: Pockets, Handles, Sides and Base. Pockets, Handles, Sides and Base Complete and finished with Piping! A large Oval Object occupies a substantial percentage of the floor/couch/bed….so quickly onto the the other major piece. Fold and press 1/2″ of long straight edge of Top FABRIC pieces. Fuse batting up to 1/2″ folded edge. Trim 3/4″ from long straight edge of the two Top BATTING pieces. Discard 3/4″ piece. 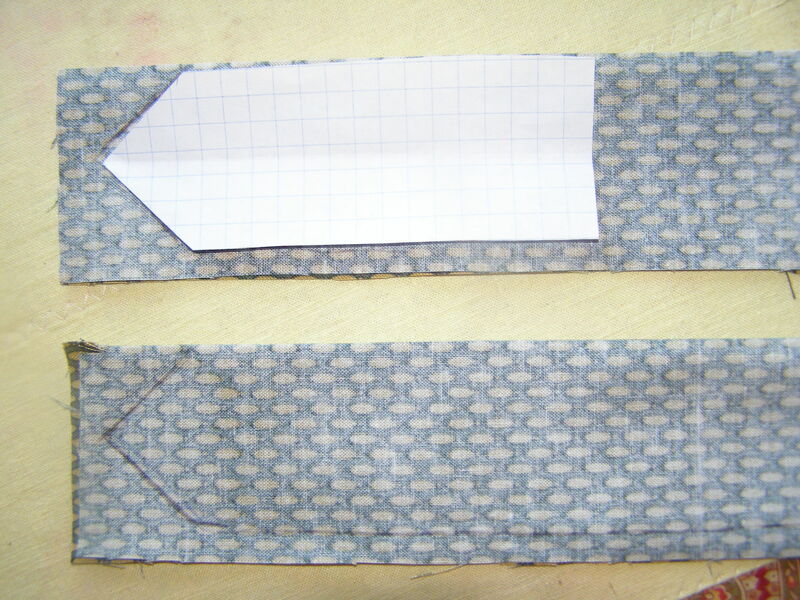 Place newly trimmed long straight edge of batting against this fold (WRONG side of fabric) and fuse. Repeat using other Top and Batting Pieces. The batting requires trimming as the folded edge will be stitched to the zipper. Butting the batting to the fold not only creates a nice sharp fold, when stitched it will secure the batting to the fabric. Find midpoint of zipper. Match it to centerpoint of long straight edge of Top. 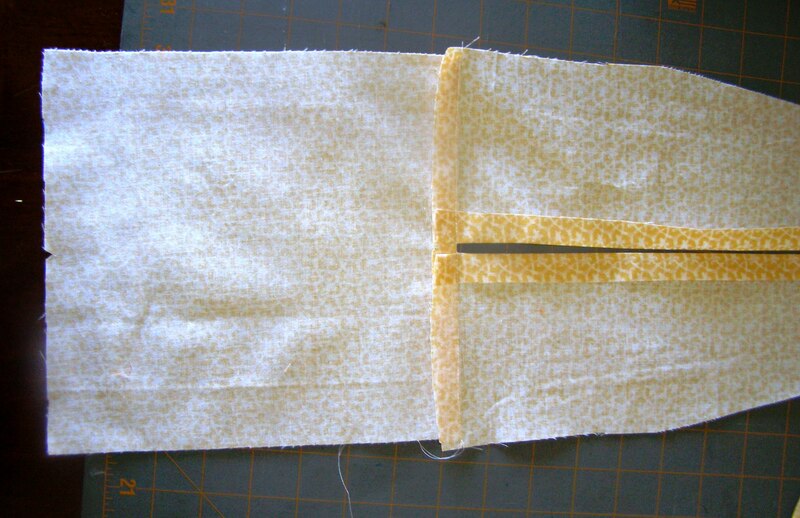 Place zipper FACE DOWN 1/4″ from edge of fabric – keeping centerpoints aligned. Pin. 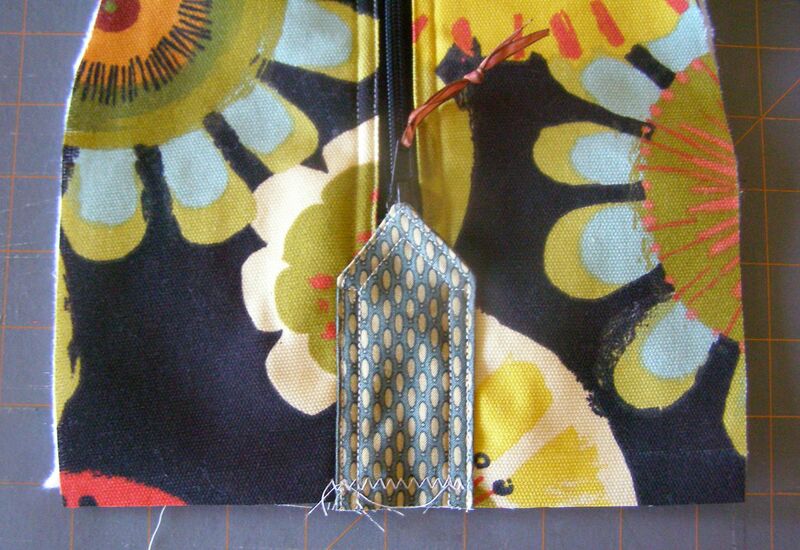 Using a zipper foot, stitch the zipper to the Top Fabric by stitching 1/4″ from outer edge of zipper tape. 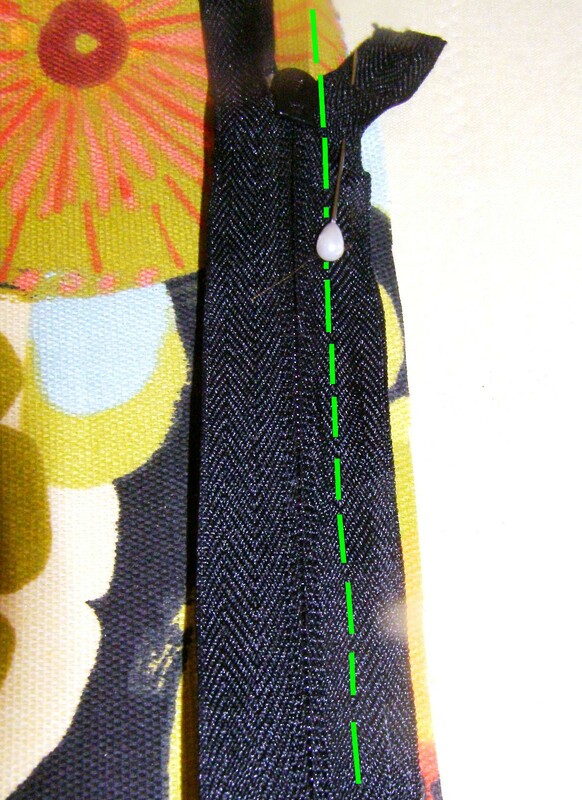 The stitching line is shown as the green dotted line in the photo. When sewing the zipper seams, it may help to sew with the zipper unzipped for a few inches, then stop and raise the zipper foot, zip the zipper closed, lower the zipper foot, and then continue sewing. The actual head of the zipper is often too large to sew around. Repeat for other side of zipper using other Top Piece. 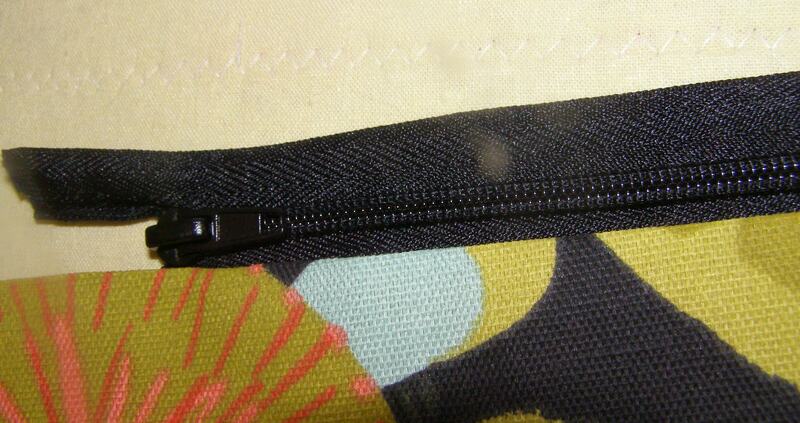 When both sides of the zipper are complete, topstitch close to edge of fabric near zipper. As shown in this photo, I got ahead of myself and did a double topstitch on the zipper. Only the topstitching closest to the zipper needs to be completed at this point. 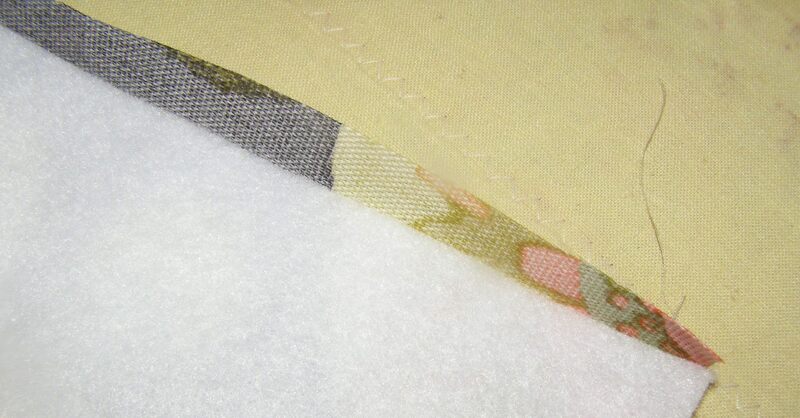 The second topstitch seam will be sewn after the lining is attached. The photo does include an important step – if your zipper is a separating zipper (like a jacket zipper). Hand stitches are being taken close to the base of the zipper to prevent it from “unzipping” all the way – and separating. If using a purse or upholstery zippers – which do not separate – this step is not required. 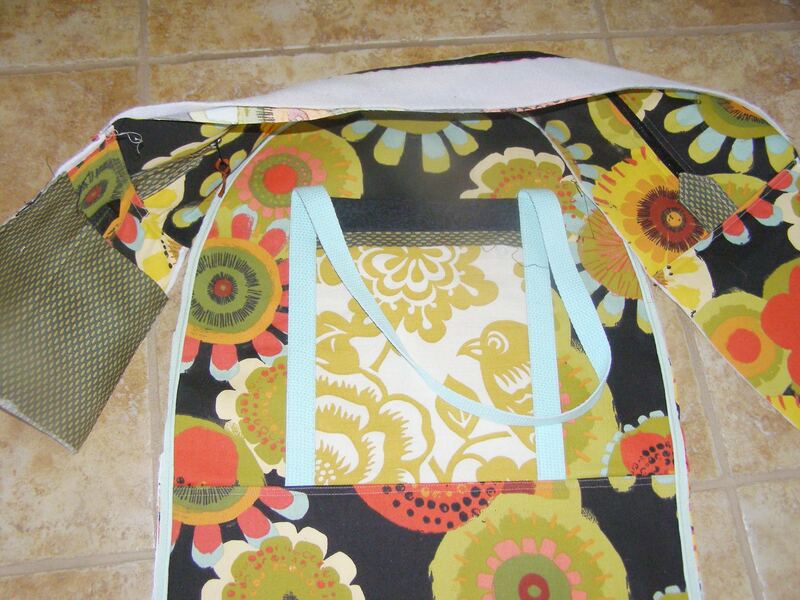 Notice also that the photo shows a 3/*” or so space between the two Top Pieces once the zipper ends. The length of this space will depend upon the length of your zipper. The space is covered later by the Zipper Stop. Take a minute and congratulate yourself on putting in a zipper! Select two small pieces of coordinating fabric approximately 4″ by 6″. Fold them in half length wise RIGHT SIDES TOGETHER. 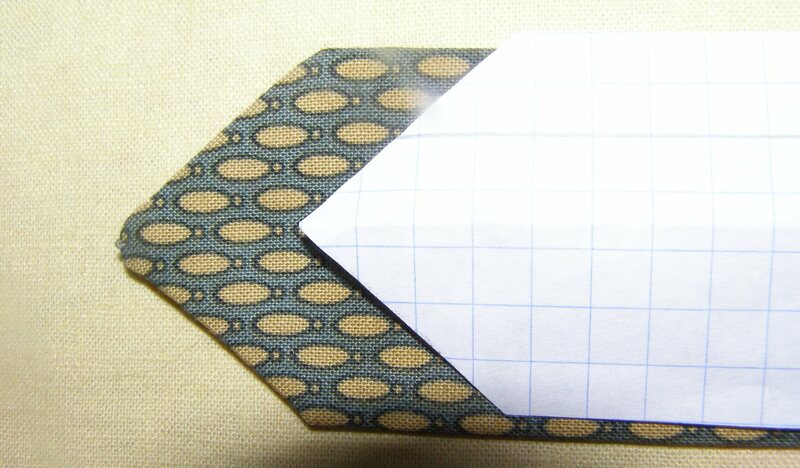 Place side of arrowhead piece against fold and trace pattern directly onto fabric back. Sew on drawn lines leaving the narrow bottom straight end opened. Trim seam allowances and arrowhead corners, and turn right side out. Press. Top-stitch close to edge and again 1/4″ away. Place Zipper Stop directly over Zipper ends as shown in photo. Somewhere between 1.5″ and 3″ of the 5″ long Zipper Stop will be required for this – depending on the size of your zipper. 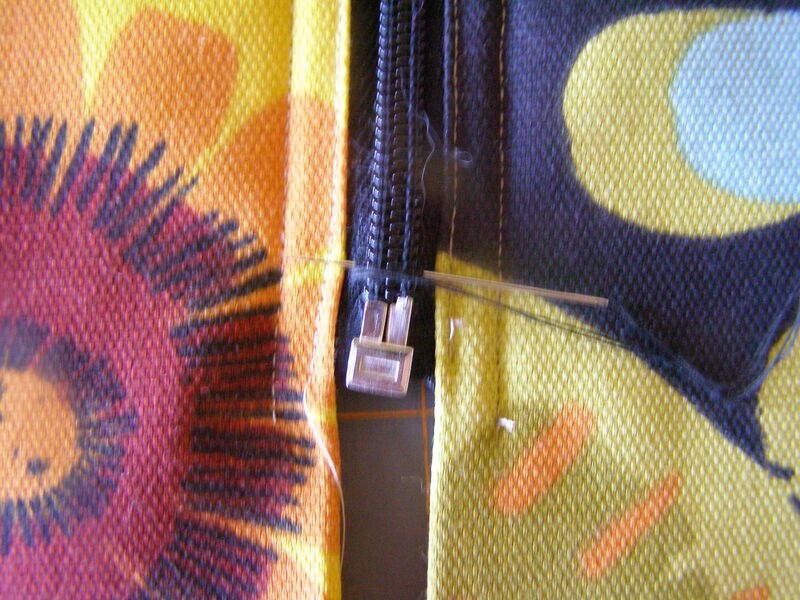 Secure the base of the Zipper Stop by zig-zag stitching back and forth. And now it is time to join the Tops to the Ends. Fuse batting to WRONG sides of Ends. To avoid confusion, mark the top end of the End with a pin. Apologies. I forgot to take a photo of this step. The photo to the right is of the same step – just of the lining. Align centerpoint of top end of Top with the centerpoint of lower end of Zipper Stop (the space between the two tops will be under the Zipper stop) RIGHT SIDES TOGETHER. 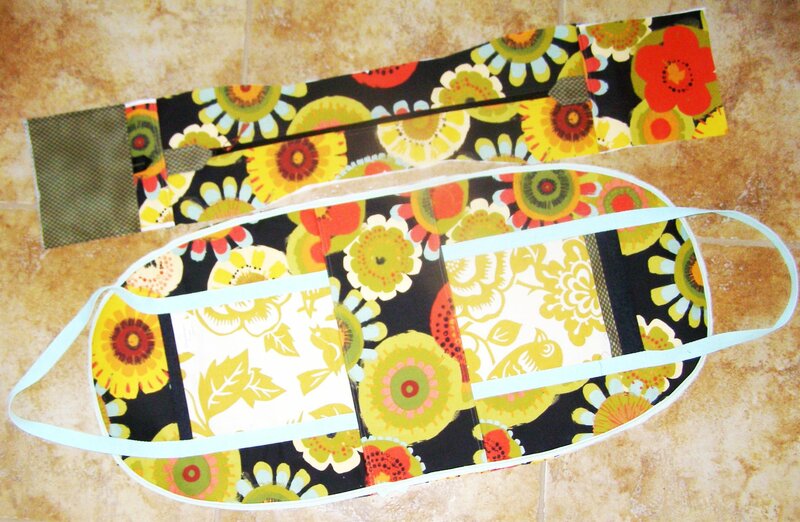 Stitch together, using 1/2″ seam allowance. Press seam toward Ends. Topstitch close to seam and again 1/4″ away. Take a minute to congratulate yourself… the two major pieces have been assembled! Top will fit along the curved edge. Lower edge of Ends fit to Base. But prior to tackling the workout that will be sewing the stiff straight edge to to an even stiffer curved edge piece, the next post will start with sewing the nice flexible single layer lining together. This entry was posted in Accessories, Bags, Purses, Sewing, Stash Couture, Tutorial and tagged DIY Bag, OVernight Bag Sewing, Sewing Bag, Sewing Bag Zipper. Bookmark the permalink.